Many volunteers are needed each year to make RoseFest successful. Please consider volunteering for a two hour shift or more. There are many options available. Just complete the RoseFest 2012 Volunteer Form and click submit. Or you can email Deb Schirber at info@eastharriet.org or call the East Harriet office at 612.824.9350 and leave a message. With the heat index reaching 103, the popular place to be was in line at the dunk tank or licking an icy cold snow cone. Friends and neighbors gathered at the 6th annual RoseFest to enjoy live music from some fantastic local bands, the popular classic car event, inflatables, carnival games and tasty grilled favorites. 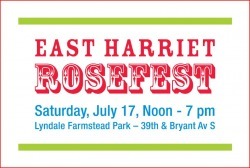 Join your neighbors and friends at the East Harriet RoseFest on Saturday, July 16 from noon to 6 pm. The sixth annual neighborhood festival will offer something fun for all ages. There will be live music, the return of the popular classic auto show, food on the grill, inflatables, lots of new games, face painting, art projects,The Amazing Scott performing magic and creating balloon animals, yoga demonstration and information booths featuring local businesses. Come and join us for a few hours or spend the day enjoying the festivities and celebrating summer! Click on the RoseFest page for a schedule of events and live bands. Great neighborhood band that has been described as Modest Mouse meets The Beatles. Local Hip Hop artists and poets will showcase their unique talent. We would love to have your help in making RoseFest, a neighborhood event held by neighbors for neighbors, a success in 2010. A number of neighbors have already signed up to volunteer. To continue the tradition of this signature event being a great experience for those who attend we need to have volunteers to handle the food and beverage offerings and lead the publicity efforts. There are a total of thirteen lead volunteer roles. Ten of these have already been filled. If you volunteer for one of these positions you will be in good company. The responsibilities of each of these positions is well documented so you won't need to create anything from scratch. RoseFest has a history, so there is plenty of prior information to use and team members for support. Each of the five volunteer positions is different from the other, as a result, they cover an exciting range of interests and skills. Give it a read and contact us at info@eastharriet.org or 612.824.9350, if you are interested in joining the team and contributing to a fun and growing event. And remember, folks can volunteer as co-leads. Share the job with a neighbor! Nature Touch and See Table with live animals and fossils. The Amazing Scott has been entertaining Twin City audiences for over ten years. He will be performing close up magic and creating balloon animals much to the delight of young children and adults alike. Drake Powe of Moe Bodyworks, will be doing a demonstration of Kripalu Yoga. Kripalu is a gentle style that focuses on developing the ability to pick up subtle messages from the body, helping to reboot our relationship with ourselves. We learn how to step out of the habitual competitiveness that we are caught in create and hold the space that allows self healing. It is great for all levels and ages. Come and relax into being! Yes, we'll have a moonwalk, but how about a 16' rock-climb slide and obstacle course. There will be games for kids to try their hand at winning prizes. 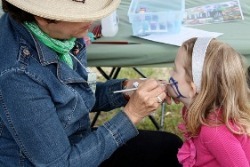 We'll also have a face painting and kid's activity tent sponsored by local business, ARTrageous Adventures Art Studio. Classic auto enthusiasts will enjoy getting a close look at over 25 classic autos, featuring MG coupes & roadsters, Triumphs and Nash Metropolitans. ReGo Electric will be on hand demonstrating their state-of-the-art electric conversion vehicle. A great opportunity to find out more about the products and services offered by a wide variety of our local businesses and members of the Nicollet -East Harriet Business Association (NEHBA). Volunteers will be grilling up some tasty hot dogs and brats with all the fixins'. So, grab some chips with that dog, kick back, listen to the music and enjoy the summer breezes. Take a picture of your children on our ponies. Tell your friends and family you went to a Dude Ranch for sumer vacation. Yes, we'll have a moonwalk, but how about a 16' rock-climb slide and ostacle course. There will be games for kids to try their hand at winning prizes. We'll also have a face painting and kid's activity tent sponsored by local business, Simply Jane. A new event for 2010! Challenge your friends or practice your own guitar skills ranging from beginner to expert levels. Don't miss the chance to become a rockstar as you jam to some of your favorite rock anthems! A scoreboard will be kept throughout the day and the highest score will be awarded a great prize. School is out for summer and Katie wants to do nothing. Planting her favorite tomatoes, she digs too deep in her garden and is surprised by Mr. Boo Boo, a funny skeleton that is full of life and ready for adventure. The Food and Beverage Setup Lead is responsible for food and beverage setup and prep that occurs the day before the event. If I am the Food/Beverage Setup Lead what do I do? on a detailed 2009 list. -Ensures sight is up on the day before the event ready for service & cooking crew to take over. The Food and Beverage Cooking and Service Lead is responsible for overseeing the cooking and selling of food the day of RoseFest. If I am the Food and Beverage Cooking and Service Lead what do I do? - Oversee volunteers who are cooking and selling food the day of the festival. -Delivers food to RoseFest participants in a timely manner. The Publicity Distribution Lead is responsible for the local distribution of the printed material. If I am the Publicity Lead what do I do? Thank you to volunteers, sponsors, patrons and contributors. RoseFest is a community-building event and fundraiser for the East Harriet neighborhood in Minneapolis. 100% of the proceeds go directly back into neighborhood programs and projects. Last year's funds helped pay for the Farmstead's "Movies in the Park" and Winter KiteFest 2009. RoseFest is co-sponsored by the Minneapolis Park and Recreation Board, Lyndale Farmstead Park, Nicollet-East Harriet Business Association and the East Harriet Farmstead Neighborhood Association. Thank you to our 2009 Volunteers, Sponsors, Patrons & Contributors! This festive summer get-together is East Harriet's signature event. 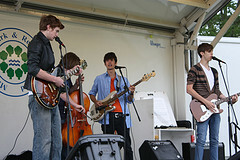 This year's festival is on Saturday, July 18, 2009 from noon - 8:00 p.m. at the Farmstead Park, 3900 Bryant Avenue South. This festival offers fun times and lasting memories for all ages. Join us for a day of great food, pony rides, inflatable rides, kids' games, classic auto show, business booths and live music all day long. Take a picture of your children on our ponies. Tell your friends and family you went to a Dude Ranch for summer vacation. Yes, we’ll have a moonwalk, but how about Black Beard’s ship, and obstacle course. There will be games for kids to try their hand at winning prizes. We’ll also have a face painting and kids activity tent sponsored by local business, Simply Jane. Rumor has it we’ll also have very special guests sitting in the dunk tank chair. Practice your aim. It might be worth hitting the bull’s eye. Classic auto enthusiasts will enjoy getting a close look at over 25 classic autos, featuring MG coupes & roadsters, Triumphs and Nash Metropolitans. Vote for your favorite classic auto in the ‘Kid’s Choice’ and ‘Ladies Choice’ awards. Sponsored by local business, Quality Coaches. Volunteers will be grilling up some tasty hot dogs and brats with all the fixins’. So, grab some chips with that dog, kick back, listen to the music and enjoy the summer breezes... they’ll make you feel fine. extravaganza for all. Written by Michael Sommers. Composed by Victor Zupanc. Performed by Rachael Davies, Dan Peltzman, Nicholas Marcouiller, Mahmoud Hakima. Accompanied by Nikolas Wintersmith. Meet Laura, East Harriet’s resident hula-hoop artist and learn how to make your own hula-hoops. It’s a great opportunity to learn some simple moves as well as experiment with more advanced techniques. All ages are welcome to join in the fun! Later in the evening during a band break, Laura will perform her original choreographed hula-hoop dance move to music. write their own material because the best things are still hand made. Fronted by bass/vocalist Karen Gustafson, who also leads the Girls Rock Camp in Minneapolis, the band plays a mixture of soulful blues and popular rock, the KGB has become a Twin Cities favorite.